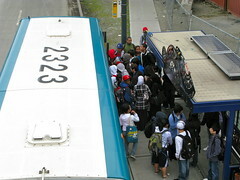 Franklin High School students boarding a Metro bus. Photo by Oran Viriyincy. The latest version of Metro Transit’s proposed service changes (discussed earlier here) will be announced this Friday. You may want to mark your calendar for Tuesday, April 28, when the public will have a chance to comment on the proposed changes at a special joint meeting of two committees of the Metropolitan King County Council: the Council’s Physical Environment Committee and the Budget and Fiscal Management Committee. The meeting will be at 6:30 pm in Council chambers on the 10th floor of the King County Courthouse, at Third and James Street downtown. The council is scheduled to vote within the next six weeks on proposed Metro bus service changes for the southeast Seattle area and southwest King County that could occur next September or February. 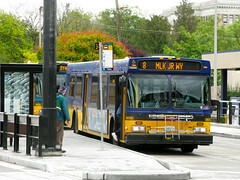 Metro is proposing to change bus service once Sound Transit’s Link light rail service begins. The purpose of these changes is to connect neighborhoods to Link stations, avoid duplication of transit services, and make bus service more efficient. These changes could affect Metro routes: 7, 7 Express, 8, 9 Express, 14, 32, 34 Express, 36, 38, 39, 42, 42 Express, 48, 60, 106, 107, 126, 128, 140, 154, 170, 174, 179, 180, 191, and 194. 36: will run every 10 minutes on Saturday. Route will operate to Othello station. 38: service 8:00 am – 4:30 pm Mon-Sat with no Sunday service. The route will run between Beacon Hill and Mt. Baker stations only. No SODO service. 39: will continue to operate, but off-peak service (mid-day, nights and weekends) will go to every 45 minutes. Peak service to remain every 30 minutes. 60: Peak directional service (AM Northbound and PM Southbound) will go to every 15 minutes. 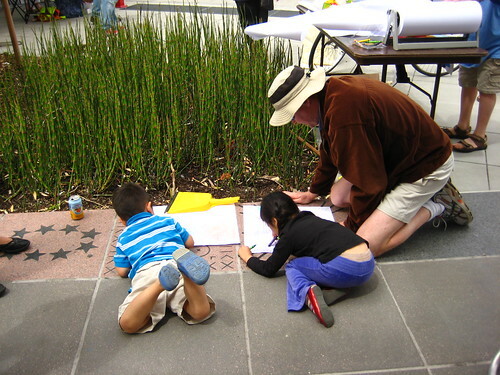 The public may comment before the council vote by testifying at the April 28 public hearing. 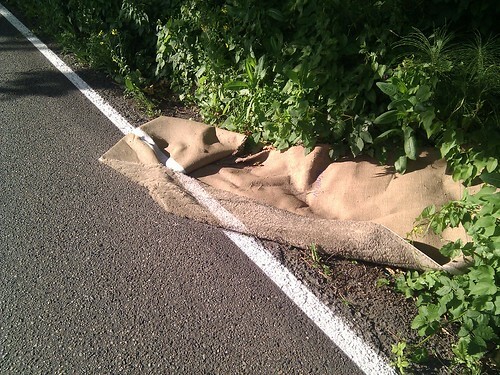 You can also e-mail comments to janice.mansfield@kingcounty.gov, call (206) 296-1683 (TTY Relay 711), or mail a letter to: King County Council Physical Environment Committee, King County Courthouse, 516 Third Avenue, Room 1200, Seattle, WA 98104. The April 28 meeting will be carried live on King County TV on Comcast and Broadstripe cable Channel 22. If you thought the latest batch of bus route changes were a done deal, you might want to think again. 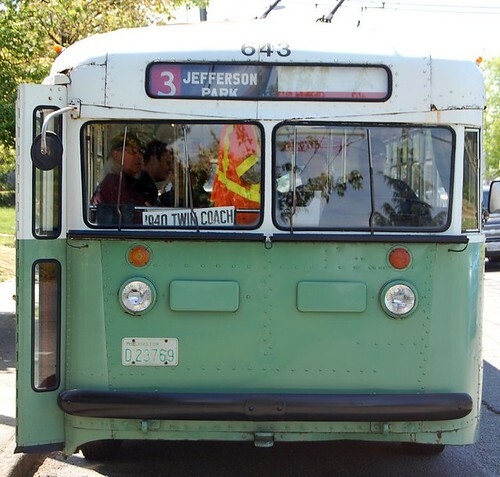 The proposed changes include elimination of the 39 (which serves the Veterans Hospital here on the Hill) and removal of part of the 14 route in Mount Baker, both of which are controversial. Folks in Mount Baker are definitely not happy, and at least one reader of the Rainier Valley Post is campaigning to have the 38 route removed completely, to save the electric loop of the 14. 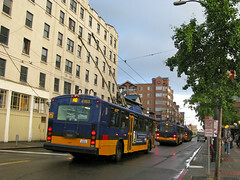 Another commenter has pointed out that the 38 serves a useful purpose for people who live on the unusually steep east slope of the Hill near McClellan, particularly the elderly and disabled, even if the 38 does follow the same route as the light rail from McClellan up to the Beacon Hill station.